Precision built, high quality tool that is designed to give you years and years of accurate, dependable service. Thomson linear bearings insure smooth precision movement for your most delicate operations, yet will stand up to the test of day-long production runs. 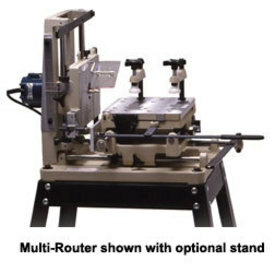 Custom furniture makers and cabinetmakers will absolutely love the versatility of The Multi-Router. A unique system of templates and ball bearing-tipped stylus enables you to quickly and accurately produce a wide variety of dimensionally sound precision joints. Seconds is all it takes to create mortises, tenons, box joints, dovetails, even angled and compound angled joinery. The optional pneumatic clamps offer even quicker results for short production runs. The quality of construction and the versatility of the Multi-Router make for a truly remarkable and rewarding woodworking experience.